Just a classic. The crystals, prismatic, have excellent luster and they are free of damage. They are doubly terminated and very well positioned on the Natrolite matrix. 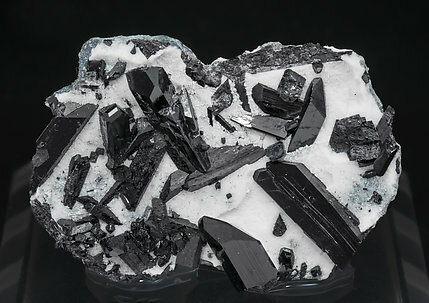 Neptunite crystals with very well defined terminations, very bright and on a rock matrix coated by white Natrolite. We’ll send to the buyer the original label and also a copy of the computer card with the full text in the collection catalog. 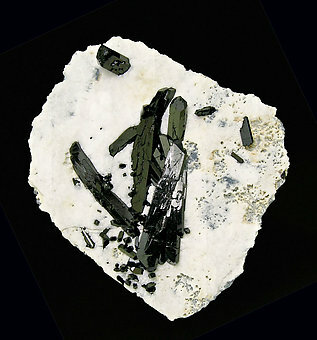 Group of isolated and very bright Neptunite crystals with very well defined faces and edges. One of them, clearly dominant, is doubly terminated and is on a perfectly vertical position on its Natrolite matrix. An American classic of great quality. The sample is from the Ignacio Hernández collection (num. 56) whose original label we’ll send to the buyer. 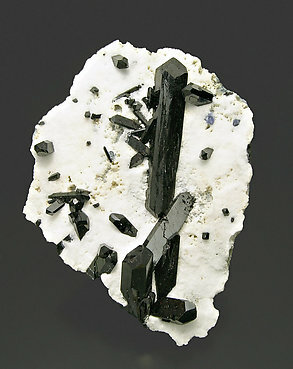 Very bright and sharp Neptunite crystals, some of them doubly terminated, of very well defined faces and edges. 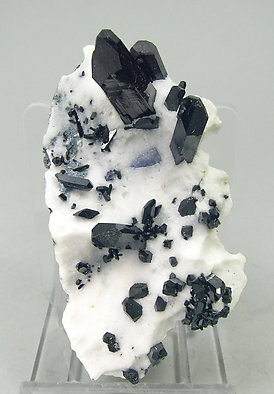 On matrix with white Natrolite, with a small crystal of Benitoite. A magnificent combination of the two uncommon species. 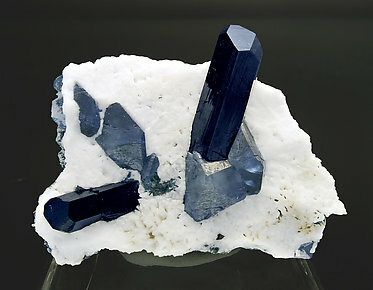 Both the prismatic crystals of Neptunite and the flat crystals of Benitoite have very sharp well-defined faces and edges, with excellent terminal faces completely free of damage. Color and luster of both minerals are also excellent. 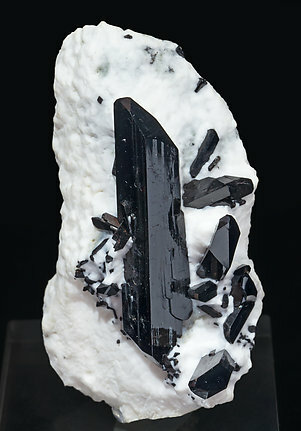 Magnificent specimen with the main crystal prismatic and doubly terminated. The crystals on the sample have excellent luster enhanced by the white matrix of Natrolite. Spread on the matrix there are some small, perfectly sharp, crystals of Benitoite.